Looking for a USED WATER JET BRICKS FOR WATERJET CUTTING? A waterjet brick is rectangular piece of corrugated plastic, such as polypropylene, used instead of slats to support material. It is most useful when machining tiny parts that could fall between the slats and get lost. It is also useful when cutting scratch-prone materials where splah back from the slats might frost the underside of the material, such as glass and mirrors. CMT waterjet brick is one of the most durable, long lasting waterjet brick available in the market place. It is made from a specific proprietary polypropylene material and can prevent the splash back during cutting. The pictures show the CMT new upgrading Waterjet Bricks, the standard size is 1220x610x100mm (48”x24”x4”) and the weight for one piece is 11 kg (24lb). 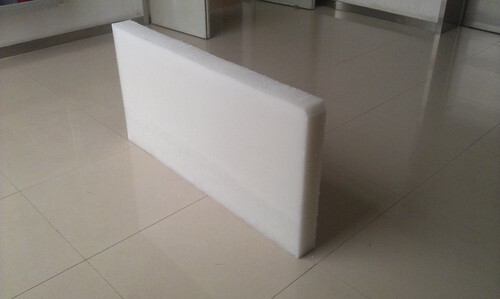 The board sheet material is PP (polypropylene) and manufactured in a proprietary process with the even flat cutting surface. It is durable and works well with both the abrasive and pure water cutting. The 8mm holes honeycomb board sheet is easy for the fixtures to fasten the working pieces on it. Compare the old waterjet bricks, CMT large size sheets make the cutting surface building time saving and easy and furthermore, they will not fall apart as rapidly as the old style bricks. CMT new waterjet bricks can be repaired easily again and again on the repeatable cutting areas thus increasing the life. Please visit cmtcutting.com or search CMT Cutting Machine Tools Co., Ltd to contact us for more information. Looking to Purchase a New CMT WATER JET BRICKS FOR WATERJET CUTTING?